Victory Industries "Mighty Midget" Electric Racer. 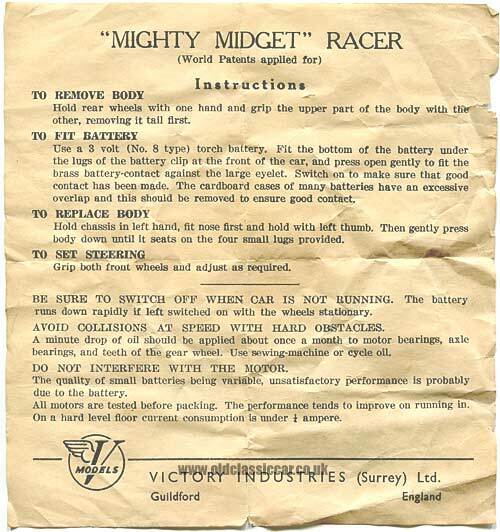 The "Mighty Midget" Electric Racer. More information on this battery power racer. 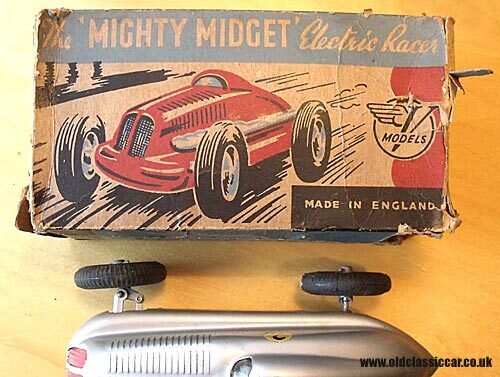 The Mighty Midget was introduced in 1948/1949. The silver example shown here still has its original box and instruction leaflet, unlike the others featured below. 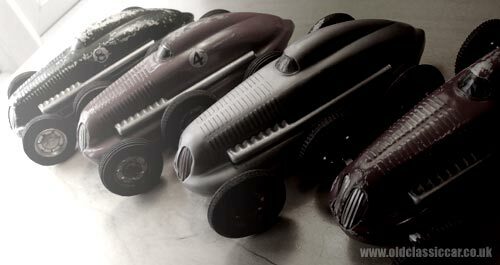 The styling is reminiscent of the streamlined cars that were used for land speed record attempts in the 1930s, and is one of my personal favourite tinplate toys of all. 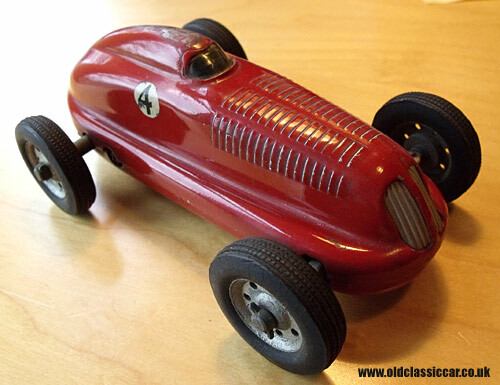 In fact it was the red example of this tin plate toy (car number 4) that set me off collecting old toy cars in the first place. The instruction leaflet advises that the car is powered by a 3 volt torch battery, that is fitted within the car itself. A small switch on the base controls progress. 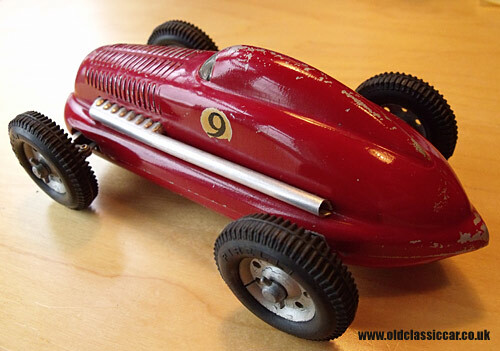 On cars number 4 and number 8 there is a different switch underneath the tail of the car, with small connectors that perhaps led via a cable to a remote control handset, which has long since disappeared on both cars alas. 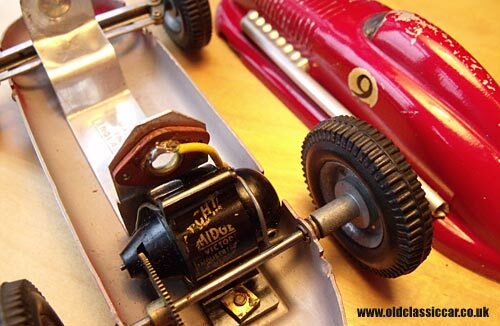 The box has some useful extra information on it - most interesting is the claim that this toy is fitted 'with patent "MIGHTY MIDGET" electric motor running at approximately 10,000 revs..' and '.. runs several miles on one battery.'. Victory Industries factory was based in Guildford, Surrey, England. 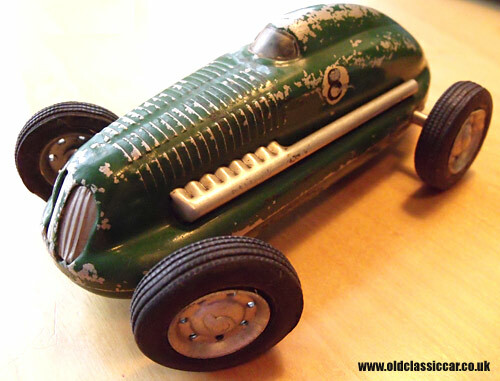 In addition to two cars having different switch arrangements underneath, the green car number 8 also has the earlier aluminium wheels, as fitted to the first examples. 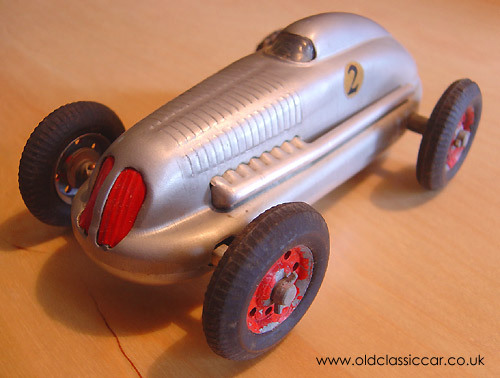 In 1950 diecast wheels with knock-on spinners were introduced, similar to those found on the Schuco 1050. I've added in extra photographs featuring both red cars, the green car with its different style of wheels, the silver car with its box, and the instruction sheet that came with the latter.